Former cop Brian O'Conner is called upon to bust a dangerous criminal and he recruits the help of a former Miami street racer who has a chance to redeem himself. THE RECOMMENDATION: Many improvements on the original The Fast and the Furious and a much more thrilling film to watch. 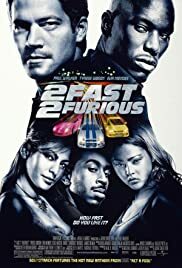 Still a large focus on the street racing portion of the “storytelling”, but 2 Fast 2 Furious features some much needed and well developed story points too. Whereas the first film feels like a plot is tacked on, the villain Carter Verone (Cole Hauser) is integrated from almost the beginning of this film. Obviously a heavy car focus is expected for a Fast film, but there are ways to make it appealing to a larger audience than just gear heads talking about which type of engine is better. 2 Fast 2 Furious makes several strides towards making the action/driving scenes more palatable to anyone besides racing enthusiasts, mainly by vastly reducing the motion blur and crazy effects used in driving scenes. It brings a much more realistic look to the film and as a result makes it much easier and more enjoyable to watch.